I’ve never been one of those Pink Stinks people, as I don’t believe that we help anyone by disparaging ‘girly’ things as weak, inferior or less desirable than ‘boy’ things. It’s far easier to be a boyish girl than a girlish boy. Deep down I think our resistance to the idea of a boy playing with dolls is latent homophobia, this nameless and baseless fear that playing with ‘weak’ girly things will turn young boys gay, as if that were (a) possible and (b) something one would wish to avoid. Of course I hate gender segmentation as much as the next person and ranted at some luckless temp in Hamleys who tried to sell me a pink magic kit. 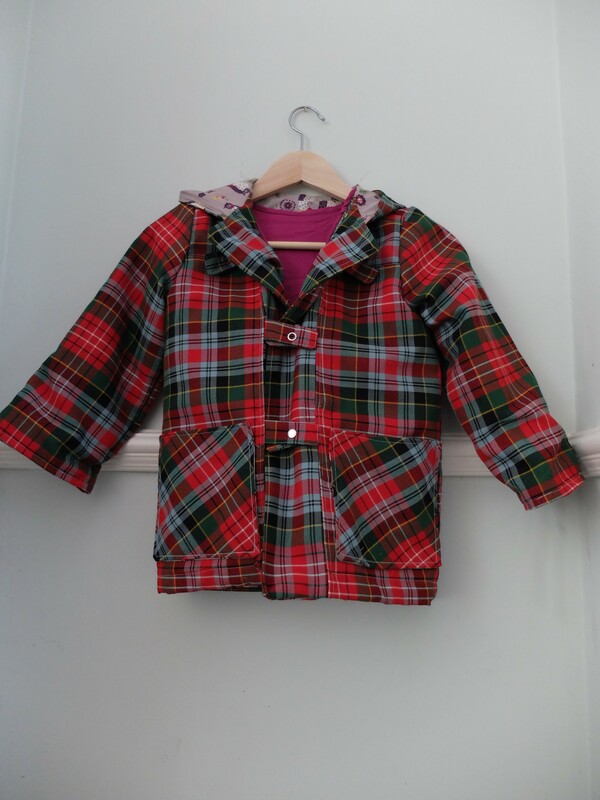 However, having sweated and bled to create this duffle coat, I was furious when J declared the colours to be not ‘girl colours’ and refused to wear it. I have a fabric shop fairly close by in Edgware. It’s called Jersey Vogue Fabrics, they last changed the window display about five years ago and it’s constantly rammed with fashion students and what I will call local colour. This used the Oliver + S School Days duffle coat pattern. Again, printing and taping was a horrible job. Cutting the pieces took hours as I’d decided I’d better match the tartan. I managed to match it.. more or less. 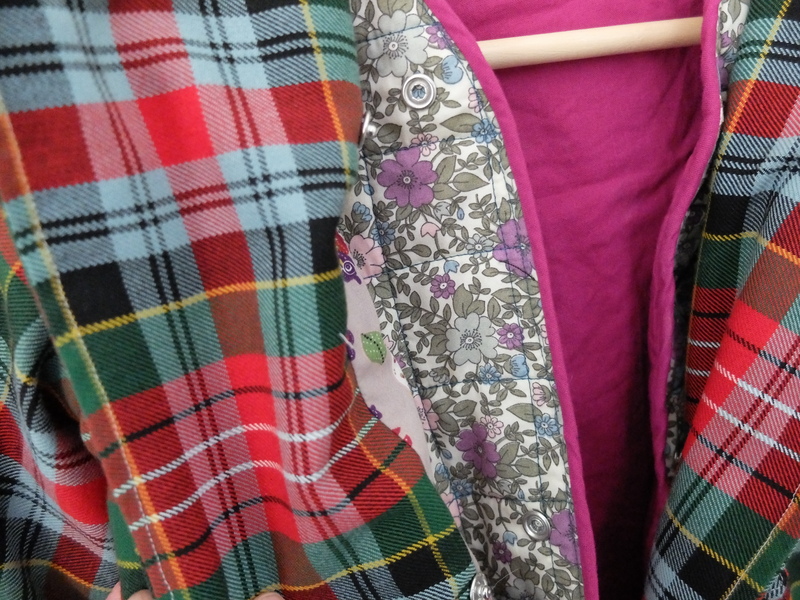 But, undoubtedly, the very most boringest part of the make was quilting the inner gilet thingy. I used some fleece I had floating around and quilted that, rather than use batting, because I had fleece, I don’t have batting, and that’s that. I figured they’re much the same thing. I just quilted by eye, because I started marking the material and thought I’d go mad very quickly doing that. The floral stuff on the inside is from B&M Fabrics, a brilliant stall in Leeds’ Kirkgate Market, and it reminded me of some old wallpaper my parents had when I was little. The purply stuff on the outside is Kona again, from Plush Addict. Quilted removable lining. I swore blind I’d never make a quilt after doing this. Once the quilting was done, the rest was easy – although maybe that’s just in contrast. Doing the lining was the best bit, turning it all inside out and realising that it looked like a coat! It does. I put the sleeves in flat as is my wont these days. I find easing sleeves in the round to be quite annoying and “pinny” and doing them flat gives me a much nicer result. 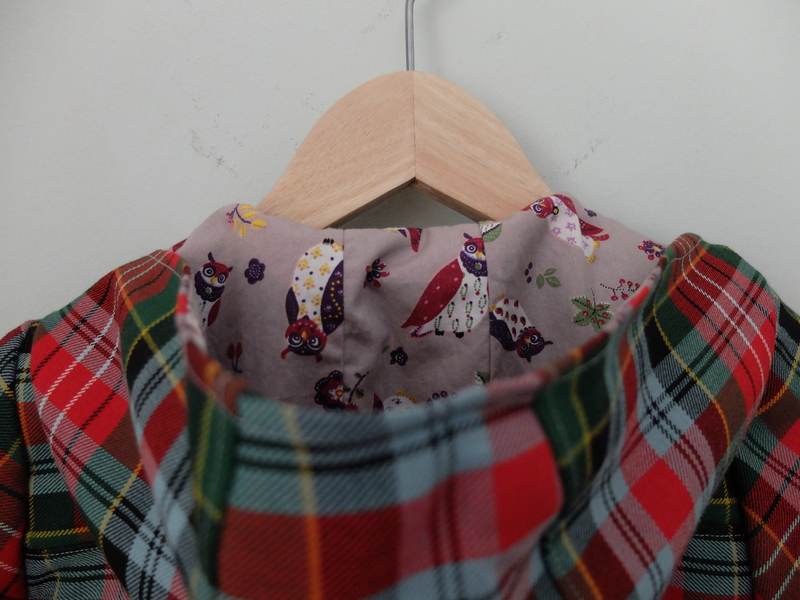 I am sure there is some jolly good reason why I should be doing them the fiddly annoying way, and indeed sometimes the construction of a garment demands it’s done that way, but if I can ever avoid it, I will. Some of the stitching around the hems and sleeves is a bit uneven, I must admit. Currently the sleeves are so long that I have to roll them up and the uneven stitching does not show! Win. J on the other hand was annoyed that I had not made it in “girl colours” once it was finished. WAT. Yes, apparently I should have made it in pink and purple. She *saw* me make it, she knew it was for her, and yet she saved her objections for the finished result! Like a little drunken dictator, she ensures that her subjects can never be sure about anything. Keeps ’em on their toes, you know. I must make sure that she never has control of a secret police force. On the other hand, being a grown up has advantages, such as making her wear the unsatisfactory coloured coat anyway. Bwahahaha. That’s where she gets it from.